Paris Pink Oh La La! Pink can create a sophisticated surround for elegant furnishings especially with cream, black and gold. Choose a pink that is soft and light as you describe but look for one that is more complex rather than clean and fresh. 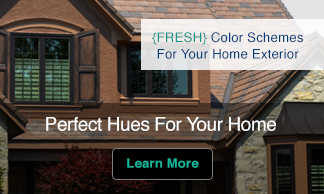 Look for a hue like Valspar’s aptly named “Paris Pink”. 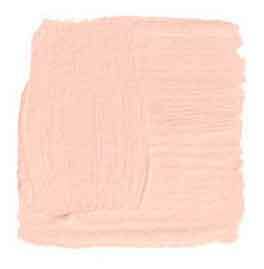 A few other pink that would work are Farrow & Balls Pink Ground, Sherwin-Williams White Dogwood or Benjamin-Moore Love & Happiness. If you would like to try a soft pink in your home you can take a tip from Designer Jackie Terrell who had this to say in House Beautiful magazine. Even if you aren’t ready for changing the scheme of a room wouldn’t it be fun to line the bottom of your drawers or inside a book case with this wallpaper? both the city and color. I just love her whimsical style. You can see more on her Painting du Jour blog. 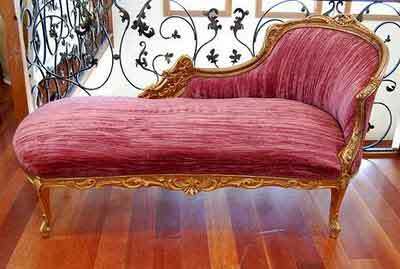 I found this tres chic chaise on her blog, too. Doesn’t it just invite you just want to sit in quiet repose and sip champagne? 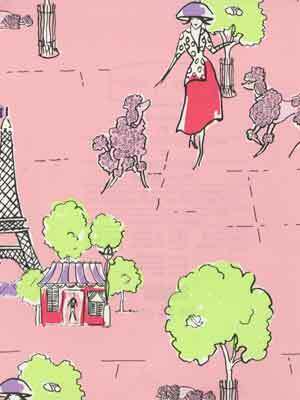 …and if you want to get all the skinny on pink see our All About the Color Pink page on Sensational Color. Thanks for sharing that about pink. I would never have considered it until you mentioned it. Lovely. Hope you are having a great Pink Saturday. Would it be OK if I have a chocolate martini instead of champagne while I rest awhile? 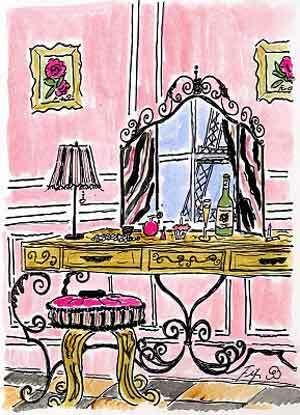 Absolutely, a chocolate martini would be a perfect palette-pleaser on that pink chaise. I would sip the chocolate martini “and” champagne while I lounged and felt “PRETTY IN PINK”…………. Merci beaucoup avec plasir Kate. Once again you tempted our ‘taste’ for color and sensationally. Hello Kate, your pink inspiration is beautiful. Love the art you shared. You are a true pinkie for sure. Happy pink celebration to you. .-= Jeanne´s last blog ..SPIRITUAL SUNDAY – PREPARE FOR MEMORIAL DAY =-. Some great pinks here and I am loving that Paris Pink!! What a perfect post to help Beverly celebrate her 2nd year of Pink Saturday. It is really beautiful. Have a great day. Blessings…Mary .-= Mary´s last blog ..Blue Cheese and Onion Burger Topping =-. Happy Pink Saturday, Kate. We’ve been pinking together for a few months now. I am so glad you decided to participate, and thank you for everything you do to make Pink Saturday special. Thank you for the wonderful birthday wishes, and for the kind words. I am another Fifi fan. Her style is unique and charming. I actually have two of her paintings in my home. My favorite color is and has been for many years a soft yellow. My mother has been living with us for twenty years now, and her favorite color is pink. 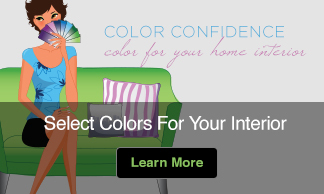 It has “grown on” me, and you will find a touch of some shade of pink in every room of our home. The only room that is actually painted pink is my mother’s bedroom. Every room has a touch of a shade of pink, navy gold and green. Many of these are found only in an accessory or wall hanging, but I do have navy leather chairs in my family room. .-= Beverly´s last blog ..A Tune For Tuesday =-.